Old Forge, NY - The Snowmoble Capital of the Northeast! A Million Dollar View! On The Water! Large Dock for your boat. Come with your family and friends for a vacation experience you'll want to repeat year after year!. A beautiful view like none other. 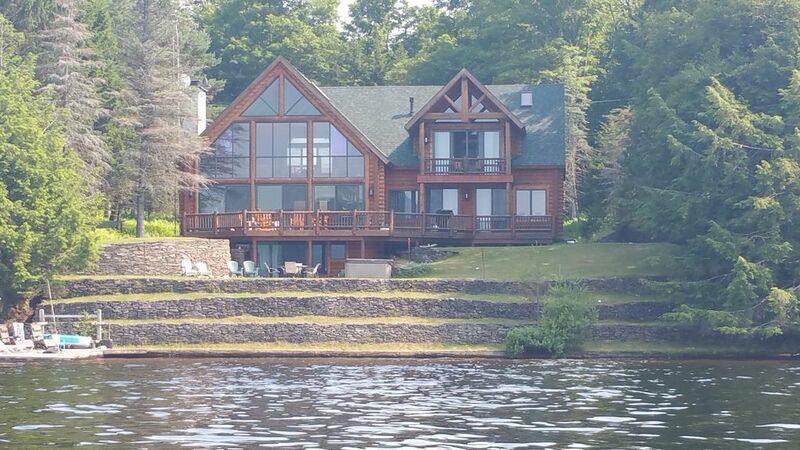 Enjoy this Waterfront Mountain View Adirondack log home. This property boasts of one of the most beautiful views on the entire Fulton Chain of Lakes featuring great morning and afternoon sun. Boating is a popular activity in the Fulton Chain of Lakes which is a string of eight lakes, continuing 16 miles, located in the Adirondack Park in upstate New York. Because many aspects of the lakes are accessible by water restaurants, such as, The Great Pines (Formerly Northwoods Inn), Daikers, and the Screamen Eagle are all accessible by boat, you can also boat to Inlet or Old Forge. At the end of a fun day on the water, whether it's fishing, watersking, tubing or just taking a slow beautiful boat ride viewing the Adirondack Lake homes; just sit back on an Adirondack Chair, light a fire in the outside fire pit and relax while making smores. Whether it be water fun, mountain climbing, golfing or hiking, or just exploring the many village shops, you'll enjoy the gorgeous mountain vistas, listen to the loons sing their songs while watching a spectacular Adirondack Mountain sunset. You can even enjoy all this while relaxing in an outdoor hot tub. Situated on the south shore of 1st Lake, this large rustic cozy, recently constructed log home offers a spacious family living area with high cathedral ceilings and two story windows facing the lake and a, oversize stone wood burning fireplace. During the winter your feet will love the cozy warm radiant in-floor heating. The six sleeping areas include 4 private bedrooms, a sleeping loft with 2 twin beds and 1 futon, and walkout basement sleeping quarters (with 2 Twin-Over-Full Bunk beds). The 3 full baths have tankless hot water heat for plenty of hot showers for all. There are 2 bathrooms with showers and 1 with Full bath shower/Jacuzzi (Tub). Old Forge is known as 'The Snowmobile Capital of the East' with hundreds of miles of groomed trails. Ski McCauley Mountain which has a 633 foot vertical drop, and 14 - 21 trails. Dock accessibility - rent a boat in town or bring your own. Enchanted Forrest-Water Safari-one of New York’s Largest Water Theme Parks. Over 50 rides and attractions with31 heated water rides. Enjoy hiking up Bald or Bear Mountain, Rocky Point or Cascade Falls. We enjoyed a short Spring weekend at this home in Old Forge. Thanks for allowing us to stay! The house was gorgeous and for the most part clean! One helpful thing, would have been to include all of the different things left in the kitchen and bedrooms for guests. We WAY over packed bedding and other kitchen items because we weren't exactly sure what would be there when we got there. We cleaned up after ourselves, but are not exactly sure why there is a $300 cleaning fee if we had to clean the floors, dishes, and take our towels and bedding with us. Overall, a wonderful place to stay. Kingfishers is an amazing house! Comfort at every turn. Plenty of room to spread out and find peace and great big open areas to come together. Kitchen worked well for cooking for 8 people. Our entire Family enjoyed a long snowy weekend in this well kept beautiful home. House was clean, everything worked :) the view is truly spectacular, parking was plentiful and when driveway was plowed (yes it snowed) they left a strip for our Floridian grandchildren so they could enjoy sleigh riding for the first time. I would definitely stay at this home again. Beautiful house in a private setting! We had a very nice stay and won’t hesitate to return. We had a wonderful weekend at this property! Plenty big enough for all 8 adults and our 7 children! The basement is the perfect for kids. We loved the hot tub and the large kitchen, a few issues with the stove and some lights but no big issues we couldn't figure out. We already looked to book again the same weekend next year but see the price on the house has increased quite a bit!! Sad to see this, because we would love to rent it again. Been staying there for 5 years now and wouldn't stay anywhere else! Located in the Adirondack Mountains in New York State, Old Forge has been the destination for generations of visitors seeking everything from serenity to adventure.